Plenty of people in Baltimore are dissatisfied with the state of our city, but few are willing to say so in public. In other cities, when leadership fails, people speak up about it. But here, things are different. Those without access or influence are ignored, while so many others who have access and influence don’t speak up, because they are too embedded within the network of institutional relationships that govern the city. The people with access live in a place called Smalltimore, and their silence is the Smalltimore Silence. The time has come to break that silence. What is Smalltimore? Some of you reading this know it already. It’s a group of people who seem to go to all the same important meetings. You might call them the city’s caretaker class, woven together into the fabric of our essential institutions – The Committees, The Churches, The Partnerships, The Politicians, The Grant Makers, The Benefits Districts, the two major employers (city government and Johns Hopkins), and our “anchor institutions,” the hospitals and the universities. These folks routinely gather together like a big family for Sunday dinner, and at the head of the table is the mayor. Everyone is beholden to her no matter how rich or powerful, because she is the one who doles out the tax deals and the contracts and the permit approvals and the social program spending — all the things that Smalltimore needs to make a living. If you are part of this status quo, speaking against it — even now — puts your new development, your nonprofit’s funding, or your livelihood, at risk. So instead of speaking up when things are not going well, Smalltimore waits for its elders to prevail upon the mayor and her team. These elders circle around City Hall, nudging and cajoling leadership towards better programs, better decisions, and better people – doing it discreetly, behind closed doors. Once upon a time, this way of handling things maintained order, more or less. But no more. Smalltimore isn’t just a bunch of white people, and it isn’t just a happenstance thing. It was invented 30 years ago, and it is a power-sharing arrangement between all the key institutions in Baltimore – and between white folks and Black folks. I know this because it is written down – in a report commissioned by the Goldseker Foundation in 1986 called Baltimore 2000: A Choice of Futures. That was a time of critical transition from a white mayor to a Black mayor. The first black mayor, coming at the end of William Donald Schaefer’s long, long run, which started back in 1971. The point of Baltimore 2000 was to describe the stakes of this transition to Black leadership, and to help the city’s business interests and foundation community find a place in that transition. For these interests, it was important that Black power didn’t just mean more government spending. They didn’t want a situation where “a private economic development agenda is pursued by the business community while the black community committed itself to a competing program of greatly enlarged public services.” There needed to be a consensus, and an agreement. It took time, but the desired consensus was achieved. After Kurt Schmoke was elected mayor in 1987, a shared civic agenda more or less took hold, and eventually the ecosystem of power that many reading this will recognize took shape. This is a map of Smalltimore. Since the late 1980s these institutions have shared and worked towards the goals outlined in Baltimore 2000 – improve the schools, fight concentrated poverty, and accommodate black political power, while preventing population decline, increasing private sector civic engagement, and growing the city’s tax base. To be blunt, the arrangement was straightforward: Black folks had the public sector, the churches, and the votes (the left half), while white folks had the business community, the foundations, and the money (the right half). If the situation were different, Baltimore Now PAC would have as one of its goals the overthrow of this entire establishment. But that’s not necessary. It’s been overthrown already. In fact, we can pinpoint the time of its overthrow: about 3 p.m. on April 27, 2015, the day of Freddie Gray’s funeral, when MTA buses were diverted from Mondowmin Mall and a gathering of young people faced off with a gathering of our police. And everything changed. Before that, much of our city still had faith that Smalltimore was making progress on the tasks it was given thirty years ago. But after, everyone was forced to see our reality for what it is. How do we know that April 2015 destabilized this entire political order? Here are three pieces of evidence. First, because the mayoral election that happened a year later was a mess. In the past, Smalltimore made sure that elections looked a lot more like coronations. There was always a favorite. Stephanie Rawlings-Blake could have been mayor for as long as she wanted (had it not been for the unrest), just as Sheila Dixon could have been before Rawlings-Blake (had Dixon not been convicted), just as Martin O’Malley could have been before Dixon, (had he not been so anxious to be governor), just as Kurt Schmoke could have been before O’Malley, (had he not chosen to retire). But 2016 was different. In the wake of the uprising, flooded with what seemed like a thousand candidates discussing a thousand issues, Smalltimore splintered into factions, split between three very different candidates — Catherine Pugh, Sheila Dixon, and Liz Embry. Second, we can see Smalltimore’s demise in Marilyn Mosby’s rise. Never before has a candidate for State’s Attorney won with literally zero support from the downtown legal and business establishment. But in 2018 she did, because Smalltimore split in half, between pro-Marilyn and anti-Marilyn factions. By and large the white factions of Smalltimore abandoned her, while the Black factions – the faith community and the political establishment – rallied to her support. Third, today Smalltimore has lost control of the conversation on issues that are now important post-Freddie Gray. Many powerful people had to fight very hard to defeat the City Council bill raising the minimum wage. And when it passed the Council anyway, the same people bad to convince the mayor to go back on her campaign promise and veto it. Then, because that veto was such a political hit, the mayor was forced to agree to a property tax increase in order to fund affordable housing, outraging many of her own donors. The entire point of the Baltimore 2000 consensus was make sure these public debates did not happen. The consensus was supposed drive, and set limits upon, the policy debate. But that’s not happening anymore. In the absence of leadership rising to the challenge of the post-2015 environment, weaving the cry for living wages and affordable housing into a broad, unifying vision, regular folks, organizing on behalf of these issues, are filling the void and leaving Smalltimore behind. We were in a moment of transition in the mid-80s, and we’re in one right now. 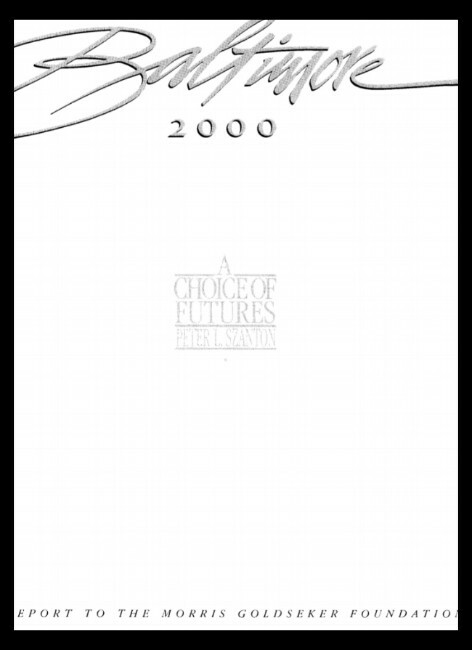 In 1986 the Baltimore 2000 report foresaw two futures for the city – a good one and a bad one. More and more, this alternative future is becoming our reality. A city split between wealthy neighborhoods and poor, between Black and white, moving in opposite directions even while living in one city. Right now, it isn’t hard to imagine our key institutions giving up on partnership and building walls instead – buying private police forces and building private islands. A Port Covington Island, a Homewood Island, a BioPark Island, an EBDIsland. All of us have to make sure this does not happen. We cannot prevent it with silence. It is time to speak up. The grassroots have already started. Having lost control of the public conversation, Smalltimore might as well join in — and stop trying to preserve a privileged position that no longer exists.